Easy Dialing – instead of having to remember specific country codes, easily call landlines or cell phones worldwide by selecting the country of choice from a dropdown menu. Payments in Skype – payment is now built into the Skype software, making it simpler to buy Skype credit, SkypeOut minutes, ringtones from artists like Madonna and more. Send Short Message Service (SMS) Messages – send a one-way SMS message to any mobile phone number in the world by selecting a SkypeOut contact, entering a mobile phone number or selecting a Skype contact’s mobile phone number in their profile. View Outlook Contacts – quickly view Outlook contacts in Skype and call directly using SkypeOut, a call from Skype to traditional landlines or cell phones. Improved Conference Calling – instantly see who is talking on a conference call as the participant’s picture flashes when they begin to speak. Shared Contact Groups – easily share contacts with friends and family and help them connect with other people; bring groups together with just one click of a button to start a group chat or conference call. Simplified Registration – create Skype accounts in one simple step. 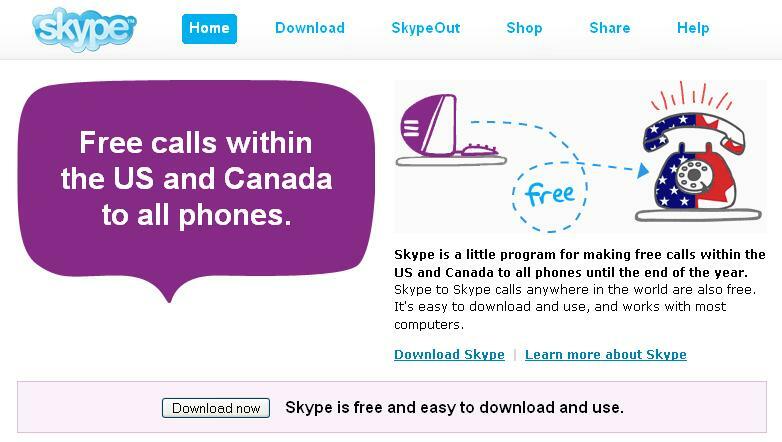 Automatic Updates – receive an automatic prompt to download the latest Skype software any time the product is upgraded. Call Quality Management – lets users adjust and manage their computer environment and internet connection to ensure they have the best possible call quality. 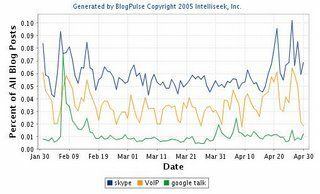 "The announcement of Skype's Skypecasting service is second in importance only to the announcement of Skype on August 31st 2003. Forget the fact you can have a conference call with 100 people. 100 is just a numbers game. 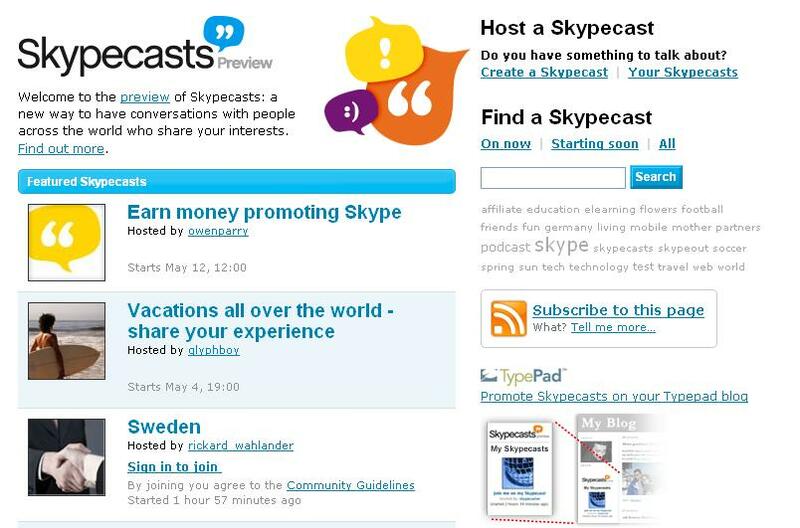 Skypecasting changes forever the idea of podcasting. Blogging will be different after today. This is the wide channel. 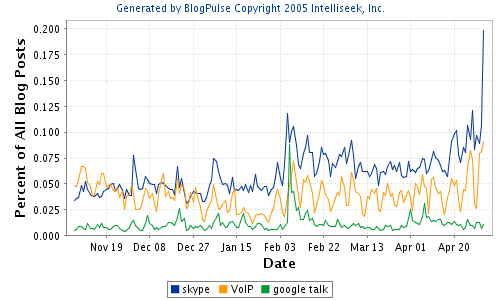 Skype in 2003 was mostly about you and someone else communicating, 1 to 1. 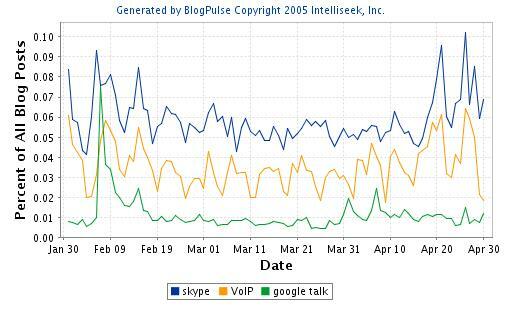 Of course in 2004 we had conferencing of up to 5. But they were mostly private affairs. Family, cliques. Skypecasting is about groups, about public. About conversations: moderating, facilitation, sharing. Skype is about global connections and exchanges. Skypecasting is your village, your pub, your community. Live, real-time, now. 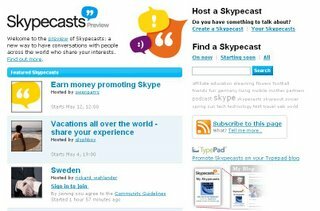 You need to play with Skypecasts. It is more than cool."